The dates for the 2019 Illuminated Tours journey to Morocco are April 26th to May 5th, 2019 . The cost is $3950 per person, based on double occupancy. The itinerary below will be tweaked as we get closer to the final program, but the overall schedule reflects what we will cover. Program will begin in Marrakech, Morocco. THESE ARE SAMPLE FLIGHTS. THERE IS NO OBLIGATION TO USE THESE, OR ARRIVE IN CASABLANCA. Many of you may choose to fly directly into Marrakech. 4:00pm: Bus shuttle transfer departs Casablanca airport with a guide. Transfer to Marrakesh (2.5 hours). For those arriving at different times or airports, we will provide recommendations on how to get to your hotel using public transportation and/or taxicabs. Alternatively, private transfer service is available at an additional cost of USD $280 per vehicle (Mercedes Viano for 6 pax). 6:00pm: Arrival at hotels in Marrakesh in the late afternoon and settle into your accommodations. Maps and programs will be provided. 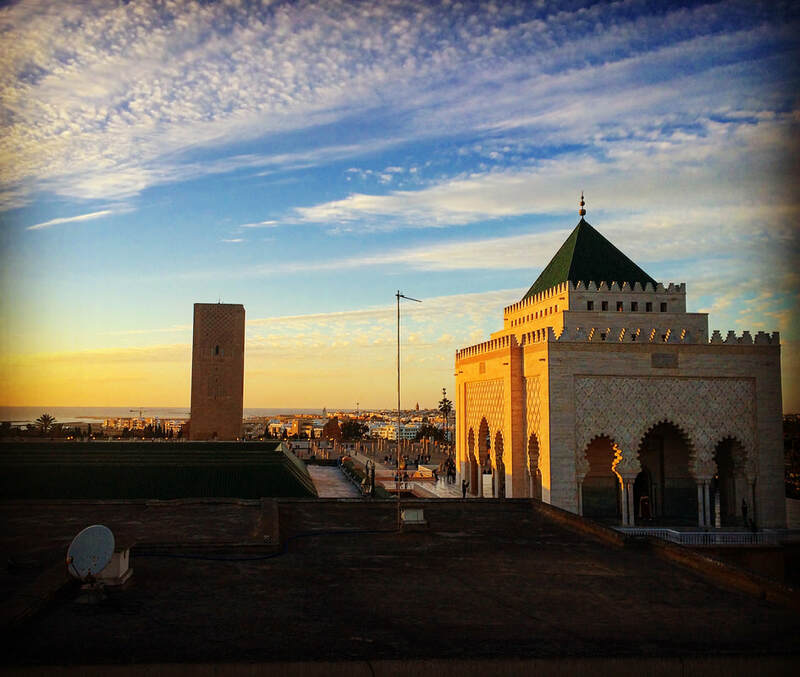 7:30pm: Walk to “home base” riad (TBD) to enjoy a welcome tea ceremony and traditional Moroccan pastries. Your tour leader will begin the trip’s evening lecture series. 9:30pm: Later in the evening, option to explore Jamaa El Fna on an independent basis. This is a 1000-year old UNESCO site with everything from snake charmers and acrobats, magicians and storytellers, to food stalls and orange juice stands. 9:00am: Meet at “home base” riad to begin the morning tour with 2 expert guides in addition to your tour leaders. Explore the most important sacred and historical sites of Marrakesh. Founded almost 1000 years ago, Marrakech is a feast for the senses and has remained at the heart of Moroccan life ever since, acting as Sultanate capital on occasions. Begin with a morning walk through the different artistic guilds of the Marrakesh medina. Here, you may witness the leather auction, the copper welders and wood carvers at work. 11:00am: Visit Madrasa Ben Youssef, an Islamic college in the old medina, named after the Almoravid sultan Ali ibn Yusuf who reigned in the early 12th century. This is the largest Madrasa in all of Morocco and one of the largest theological colleges in North Africa - housing as many as 900 students. 12:00pm: Tour of the Koutoubia Mosque (from the outside - Muslims may enter if doors are open at the time) - completed under the reign of the Berber Almohad Caliph Yaqub al-Mansur in the late 12th century. It is a sister monument to the Giralda of Seville and the Hassan Tower of Rabat. 1:00pm: Bus transfer from Koutoubia Mosque to AMAL Foundation. Have lunch at Nora Fitzgerald’s AMAL Foundation - a non-profit that helps disadvantaged women gain work experience by training them in culinary arts. 2:00pm: Historical and religious scholar Michael Abdurrahman Fitzgerald will give a talk on Sufism in Morocco and Andalucia (TBC). 4:00pm: Bus transfer back to Koutoubia Mosque. Afternoon and evening at leisure for discussions and lecture series. 1:00pm: Lunch break for 1 hour in the medina. 2:00pm: Regroup to continue the tour of the Seven Saints. 6:00pm: Retun to “home base” riad for discussions and lecture series. Evening at leisure. 9:00am: Meet at “home base” riad to walk to bus pick-up and transfer to the Center for Language and Culture for an introductory Arabic course led by Emmanuel Hamza Weinman (TBC). 12:00pm: Bus transfer back to drop-off location. Afternoon at leisure for additional touring, discussions and lecture series. An expert guide and vehicle will be at disposal. 9:00am: Meet at “home base” riad to walk to bus pick-up and transfer to La Pause in the rocky desert landscape outside of Marrakesh. 10:00am: Arrival at La Pause where you will be greeted by the staff and settled into your accommodations - early check-in depends on availability this day. Morning at leisure to enjoy the peaceful grounds of La Pause. 12:30pm: Meet at the private tent for lunch. Afternoon & Evening: At leisure for lecture series and discussions. Morning: At leisure. Activities on the grounds of La Pause can be organized 48 hours in advance at an additional cost to be paid directly to La Pause. 11:00am: Bus transfer to Marrakesh airport where you will board your non-stop flight to Fez. We recommend getting a bite to eat at the airport. 2:25pm: Air Arabia flight 702 departs Marrakesh for Fez Saiss Airport. 3:35pm: Flight arrival at Fez. A guide will welcome you at the airport. Bus transfer to your hotels. 6:30pm: Meet at “home base” riad for lecture series and discussions. 9:00am: Meet at “home base” riad to begin your tour of the Fez Medina with 2 expert guides in addition to your tour leaders. Spend the day exploring the winding alleys of the Fez medina (the old town) where some of the most important religious sites can be found. Fez is the oldest of Morocco’s imperial cities and its medina is the largest car-free urban UNESCO site in the world. During this special tour, experience the alluring charm of the old town, the colorful streets and souks, and the rich tapestry of life that exists within its ancient walls. 11:00am: From the outside, visit the world’s oldest university, Al Quaraouiyine; Aïn al-Khail mosque where Ibn Arabi used to pray; Medrasa Seffarine, built in 1270 and still in use today; and of course the tomb of Moulay Idriss, the founder of Fez and great grandson of the Prophet Muhammad. Muslim travelers will be able to enter the sites. 1:00pm: Lunch on your own. 3:00pm: Continue your tour visiting the mosque and zawiyah of the Sidi Ahmed Tijani, founder of the Tijani tariqa. Pilgrims have for many years come here from across West Africa, often on their way to Mecca. Tijani, who died in Fes in 1815, has millions of followers around the world. 5:00pm: End your tour back at “home base” riad. Late afternoon and evening at leisure for discussions and lecture series. 9:00am: Meet at “home base” riad to walk together to the bus pick-up location. Bus transfer through the Fez countryside and surroundings to explore the religious town of Moulay Idriss Zerhoune (approx. 1.5 hours away). This is Morocco’s most spiritual center. It was here that Moulay Idriss I, grandson of the Prophet Muhammad, arrived in 789, bringing with him the religion of Islam, and starting a new dynasty. In addition to founding the town named after him, he also initiated construction of Fez, continued later by his son, Moulay Idriss II. 12:00pm: Visit the ancient capital of Meknes, considered to be the Versailles of Morocco. Meknes is the “poor brother” among imperial cities of the country. It was developed as a capital late in the history of the nation, in the 17th century, and only briefly by Sultan Moulay Ismail’s (1672–1727). Meknes is named for the Miknasa Berber tribe. The city’s Friday mosque was built in 1199-1213 along with the main city gates. Back then, Meknes was a prosperous commercial city, known also as a spiritual and educational hub. Meknes offers a “snapshot” of Morocco’s last imperial era. Moulay Ismail’s palace-city (over 40 km. of walls, not counting outer defences) is a stupendous investment of might in masonry. It also proved both durable and adaptable to modern city growth.During the Protectorate, Meknes was an important center of European colonization. 1:30pm: Have lunch in Meknes at your leisure. 4:00pm: Regroup at an agreed upon meeting point and transfer back to Fez in the late afternoon for an evening at leisure. 5:30pm: Back at “home base” riad, enjoy the late afternoon and evening at leisure for discussions and lecture series. 5:00pm: Meet at “home base” riad to walk together to the bus pick-up location. Bus transfer to the top of Mount Zalagh which overlooks the city of Fez, and learn about the spiritual significance of this mountain. Mount Zalagh, covered with olive groves and scented by wild lavender, offers a view of the entire city and the surrounding landscapes—the Sebou Valley, Rif Mountains and Sais Plain. Part of the Rif Mountains, this mountain is considered sacred to Moroccans, as it is the retreat site of a well known saint and scholar: Sidi Ahmed al Barnoussi. Sidi Ahmed El Bernoussi was a 15th century sufi saint who was a master in theology, numerology and alchemy. His best work is the foundation of Moroccan sufism. He still has disciples to this day who come to Mount Zalagh to give prayers and pay their respects. Watch the sunset from Mount Zalagh - prayer rugs will be provided for those who wish to perform their prayers in this sacred place. 8:30pm: Return to Fez for an evening at leisure. There is no obligation to leave from Casablanca. Some friends will choose to fly out of Fez directly. 7:00am: Meet at bus pick-up location for the Casablanca airport shuttle (approx. 3.5 hours). For those departing at different times or airports, we will provide recommendations on how to get to the airport using public transportation and/or taxicabs. Alternatively, private transfer service is available at an additional cost of USD $280 per vehicle (Mercedes Viano for 6 pax).